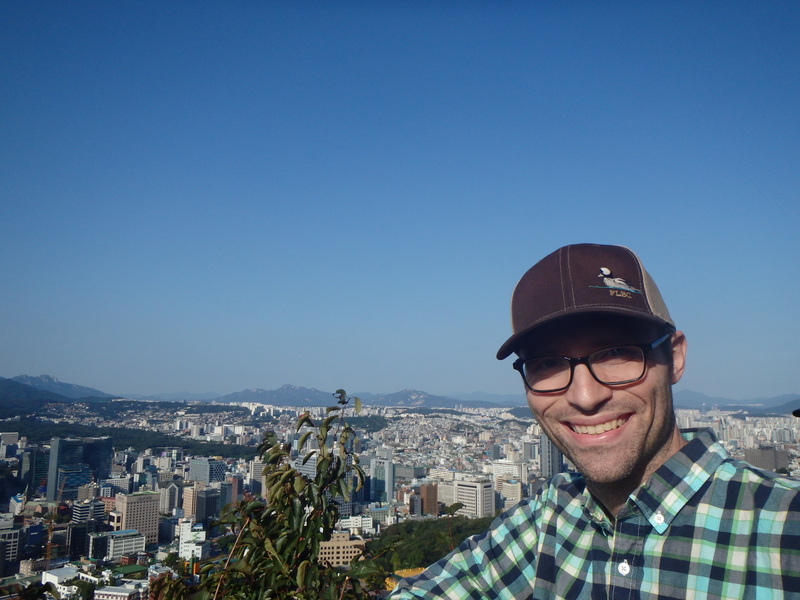 Fall is in full swing in Korea and the weather is just gorgeous. It’s a real change for us. In Texas, October brings unpredictable weather; it could be hot enough to go swimming one day and then bitterly cold the next. 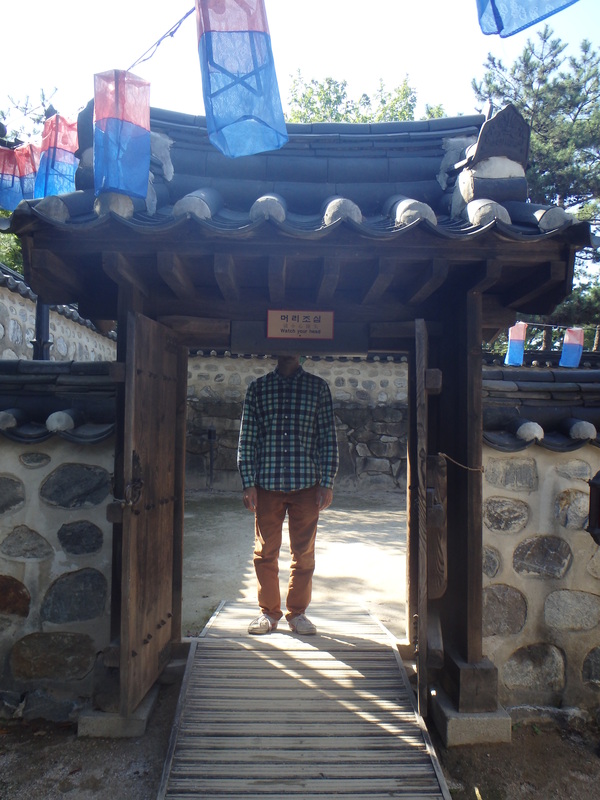 In Korea the weather is much more stable. 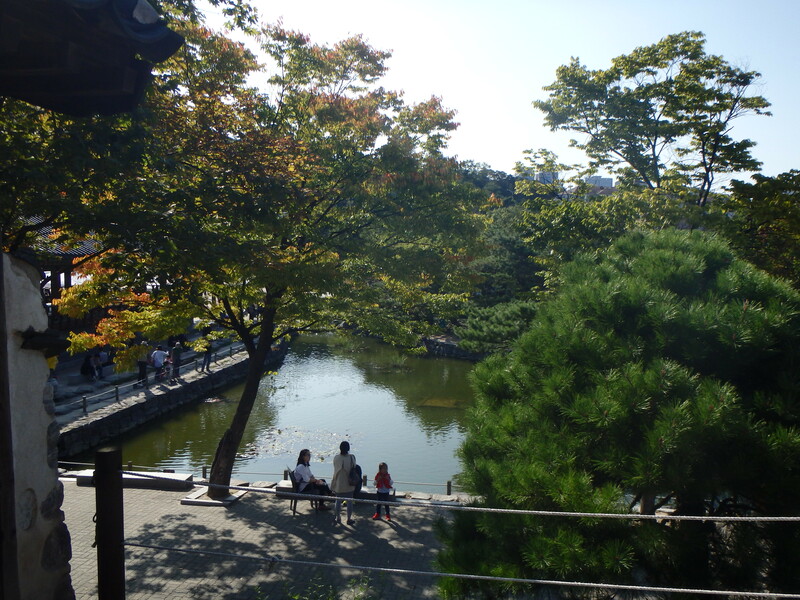 It’s chilly in the morning, warms up during the day, and then can be quite cold at night. I can tell we are in for a real surprise this winter… But while the weather is enjoyable we are trying to make the most of our weekends. 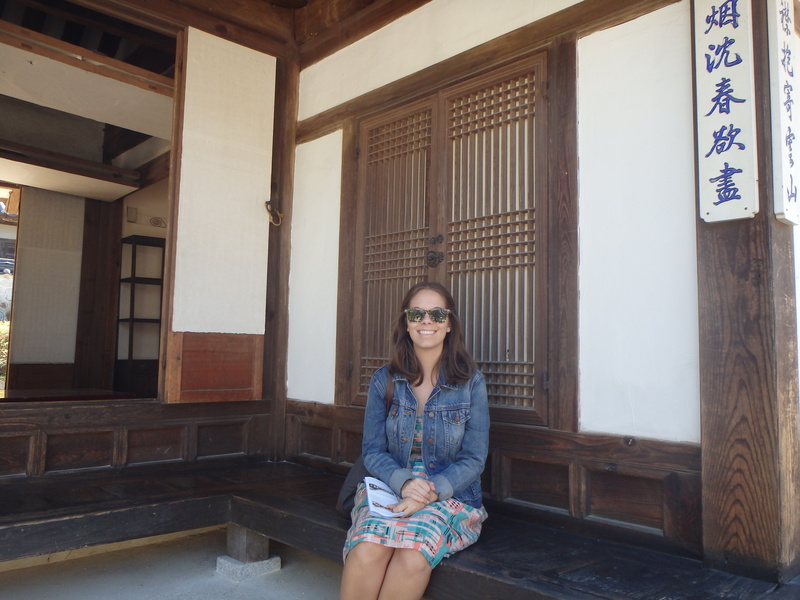 On Sunday we ventured into Seoul to visit the Namsangol Hanok Village and N Seoul Tower. 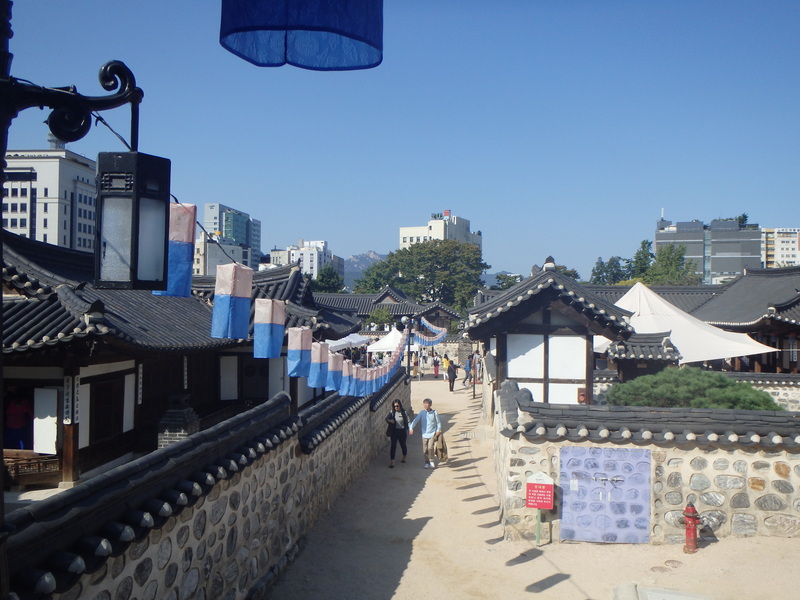 Unlike Bukchon, Namsangol is a Hanok Village that was created. 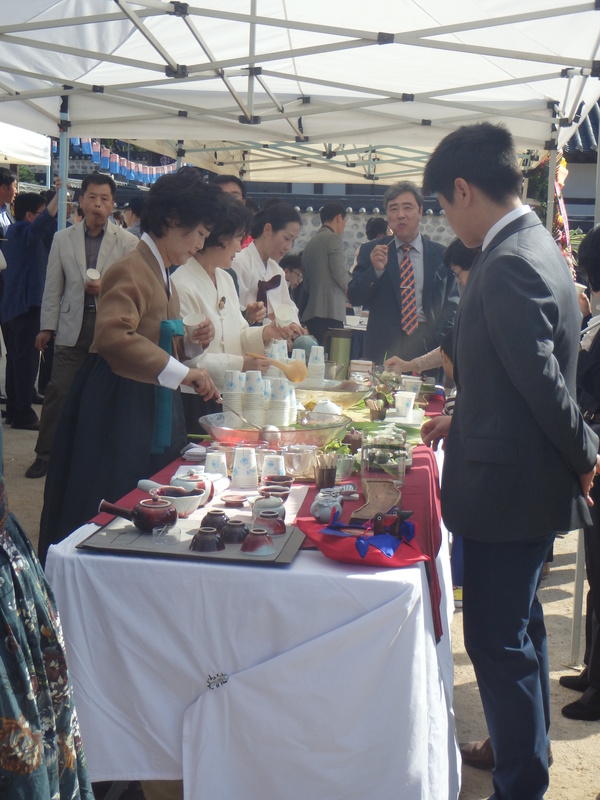 It is purely for the education and preservation of Korea’s cultural heritage. 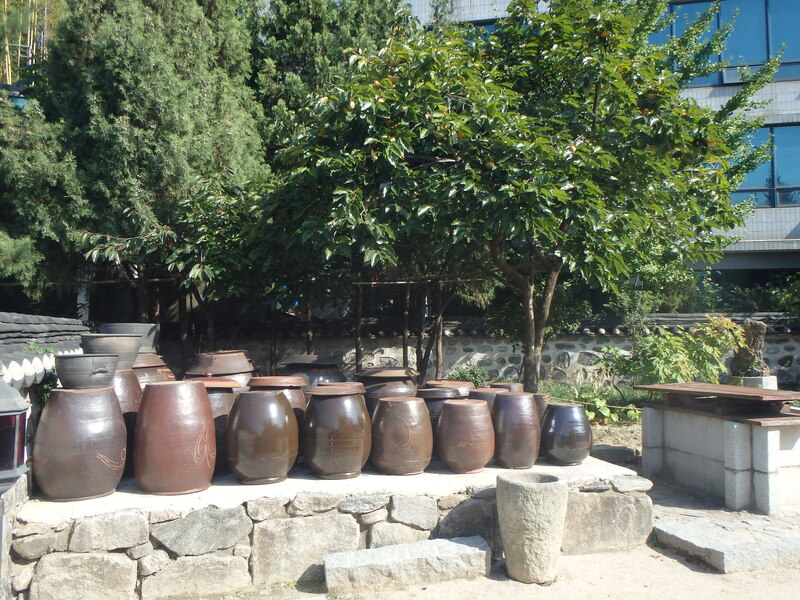 There are five hanoks that were relocated or replicated at Namsangol. It’s sort of like looking at frontier cabins in the US – after a while they all look the same – but it was a nice chance for us to be able to see hanoks more intimately. They are such beautiful structures. 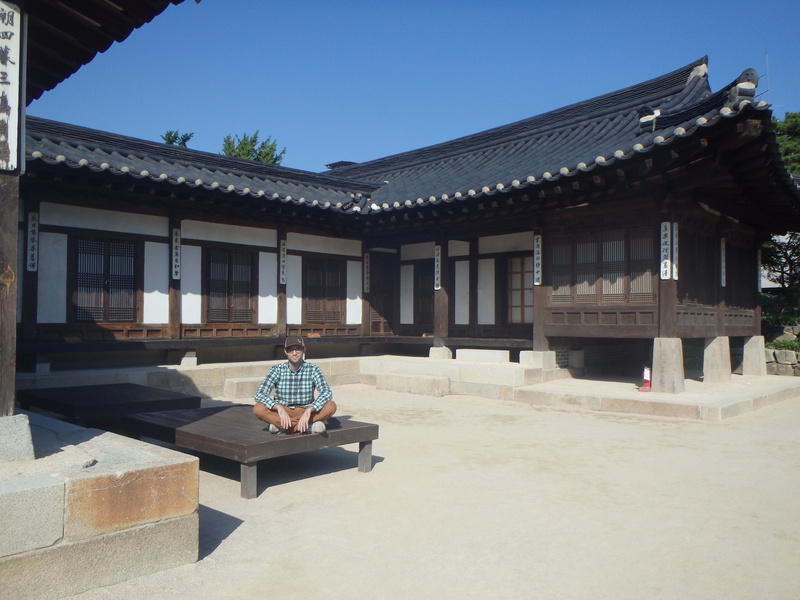 This house was built in the late 1860s by a master carpenter who helped rebuild Gyeongbok Palace. This house was built in the 1890s. 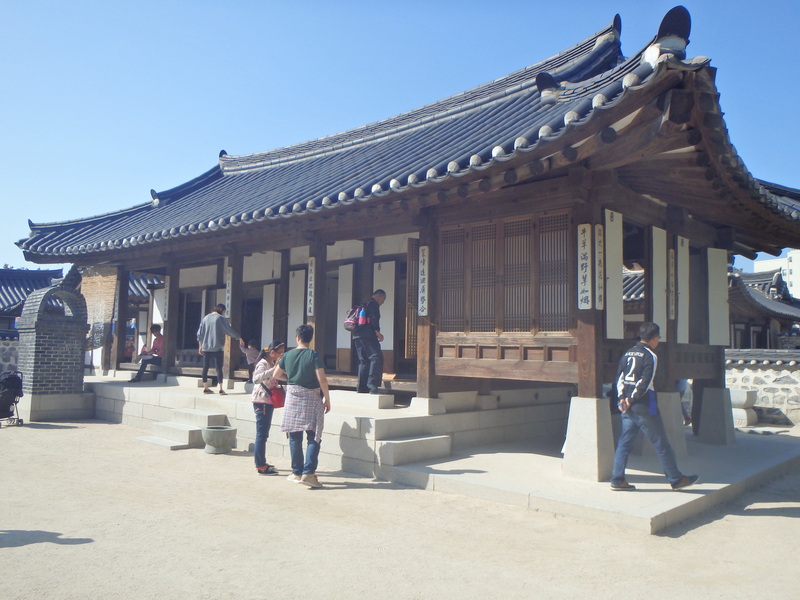 This hanok is also a replica. 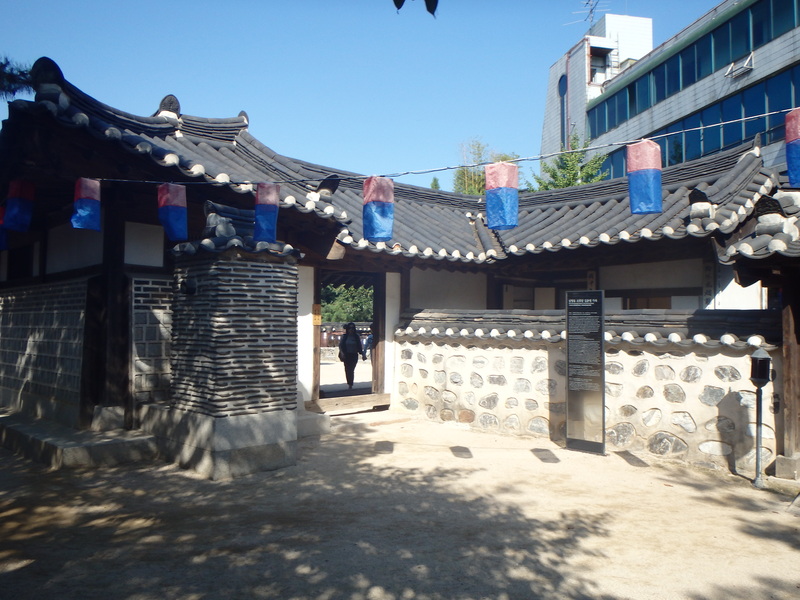 The original was the home of Empress Sunjeong’s parents. 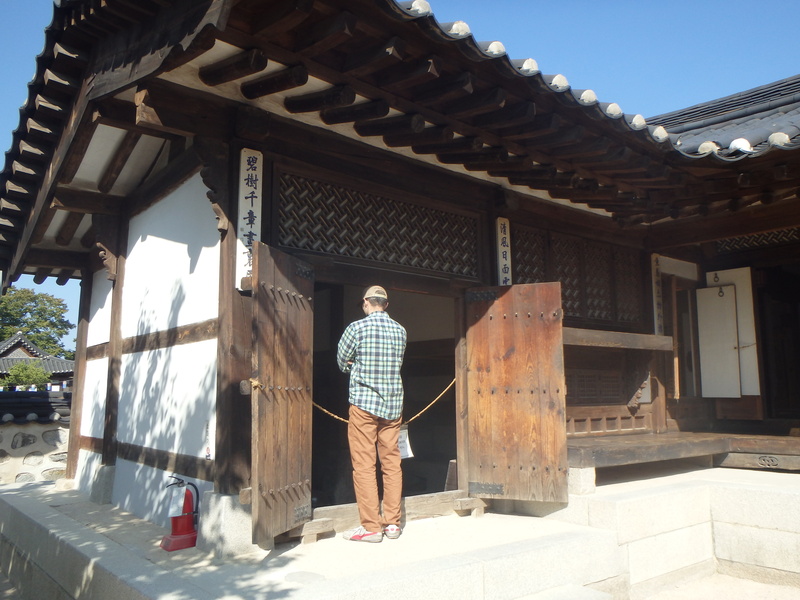 Apparently they attempted to move the original hanok but felt it was too fragile. Hanoks are shaped according to their environment. 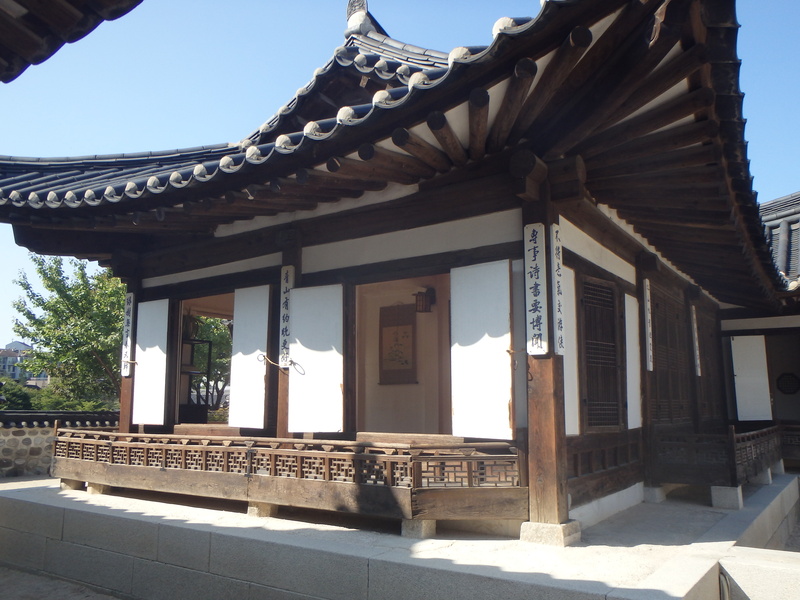 In the northern part of the country where it is colder, hanoks are shaped like the Korean letter, ㅁ, and have a courtyard in the center with different parts of the house on each side of the rectangle. 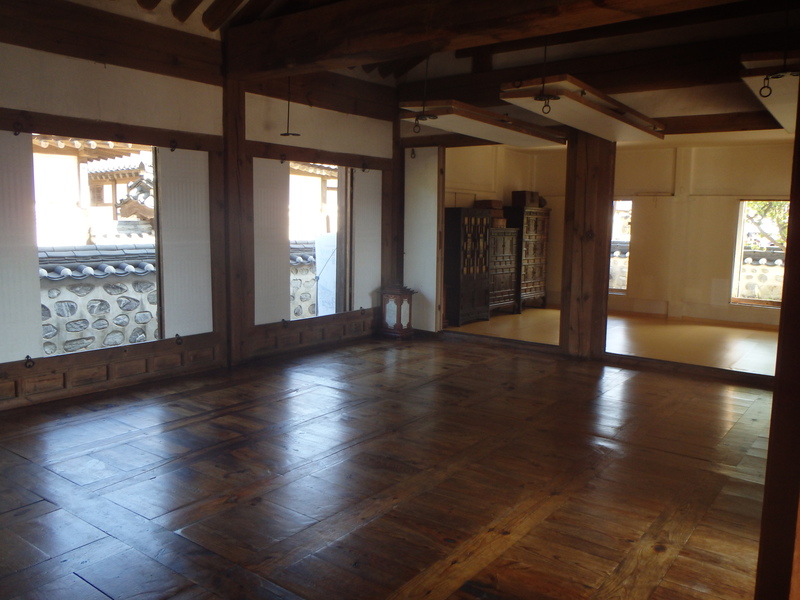 The house of Empress Sunjeong’s parents was built like this. 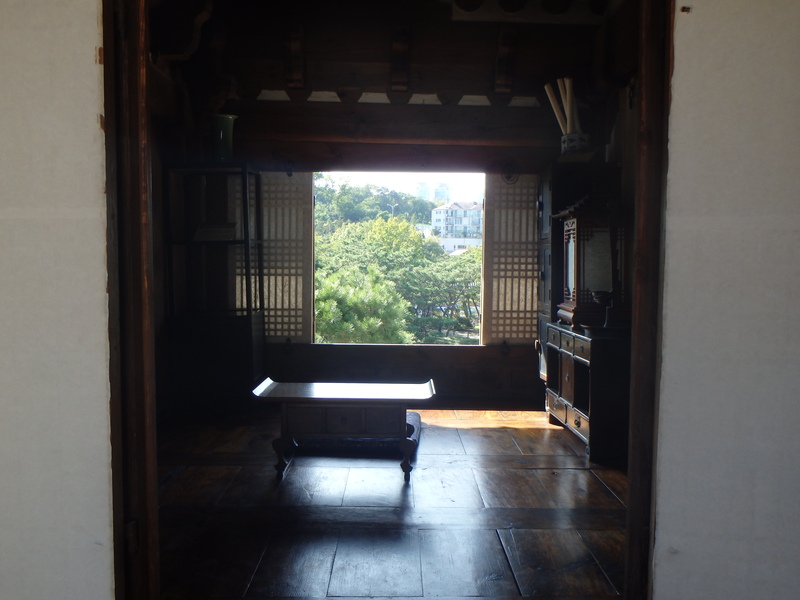 In the southern part of the country, hanoks were built in a single line like the Korean letter, ㅣ, with lots of windows and high ceilings. 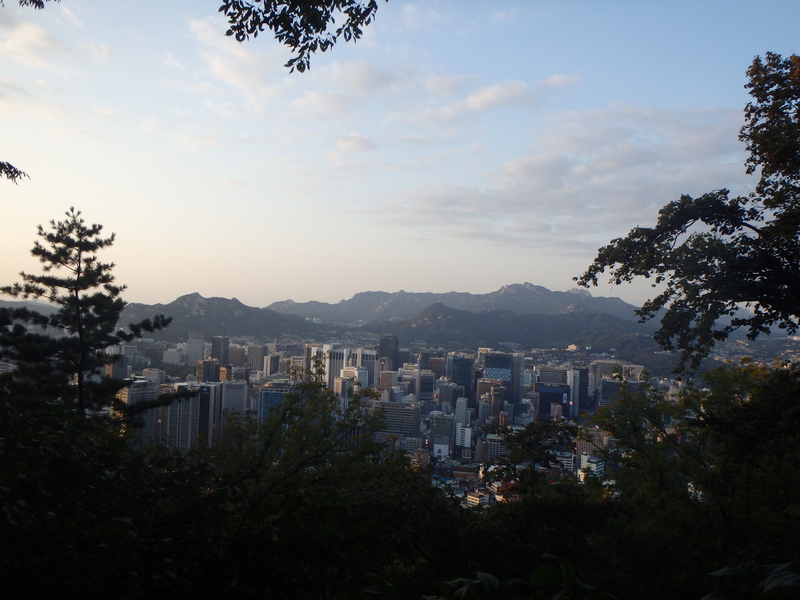 In the central part of the country, the northern and southern styles converged to create a shape like the Korean letter, ㄴ. 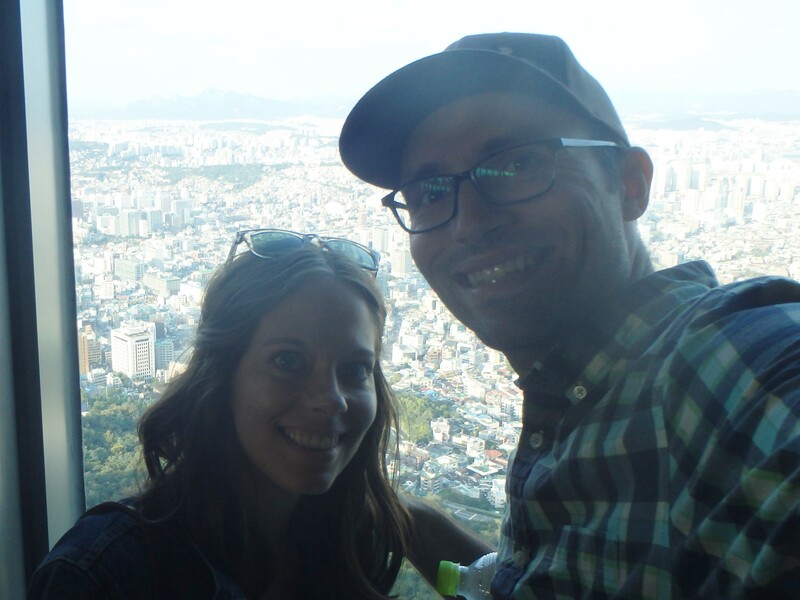 After leaving Namsangol we ventured over to Myeong-dong to catch the cable car up Mt. 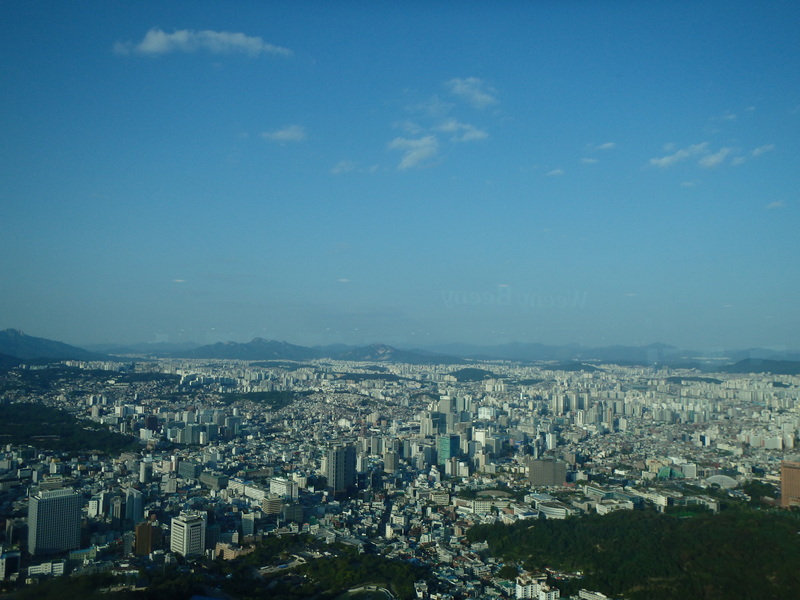 Namsan & N Seoul Tower. 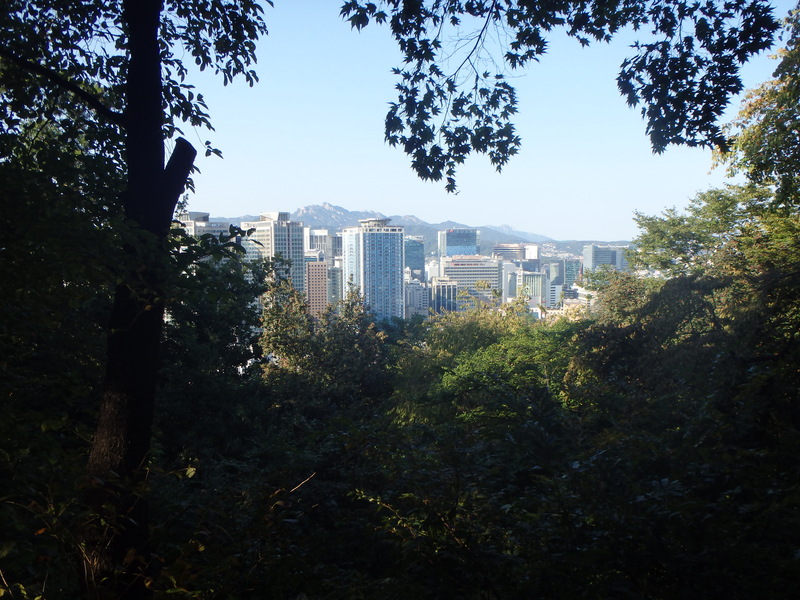 It was a fairly steep walk up a couple of streets to the cable car – I think there was probably a less strenuous route. 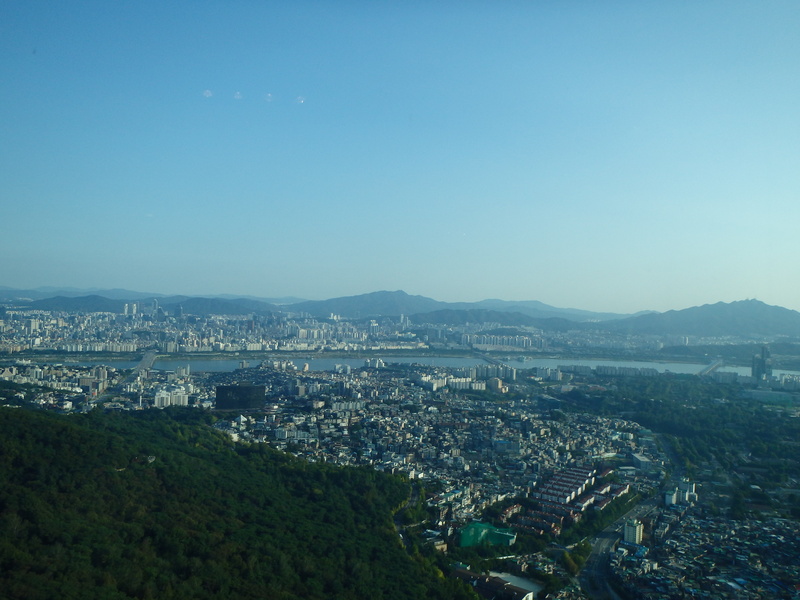 When we got to the cable car there was a 70 minute wait! So we decided to walk instead and I’m glad we did! 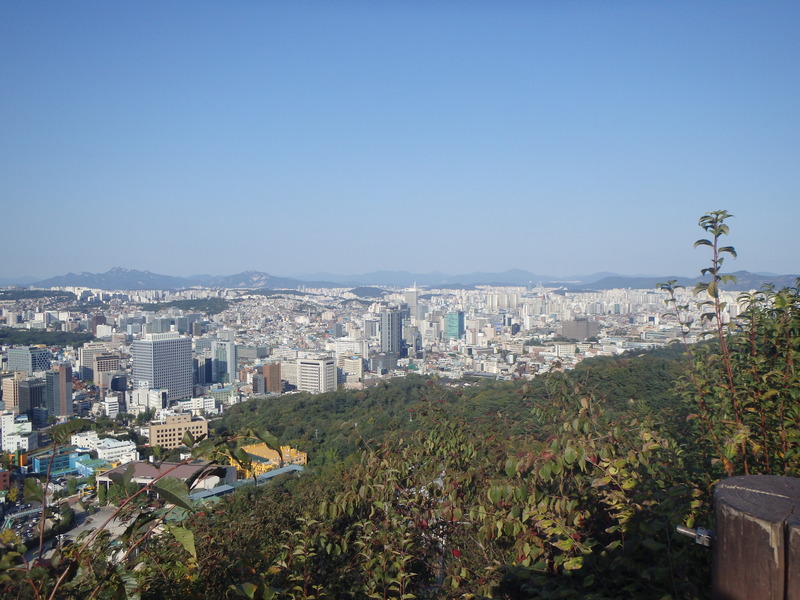 Namsan means “South Mountain” and was the southern boundary of old royal Seoul. Portions of the fortress wall can still be seen on the mountain. 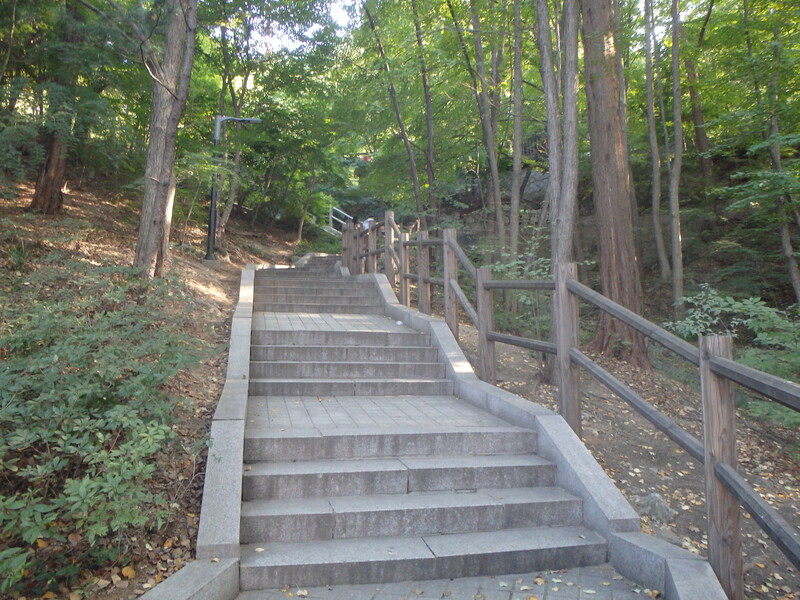 At the top there is also a fire beacon (Namsan Bongsudae) that was used during the Joseon Dynasty. There are 5 stone beacons; the number of beacons lit determined the nation’s security. If one fire was lit it meant the nation was at peace and if five were lit it meant the nation was at war. 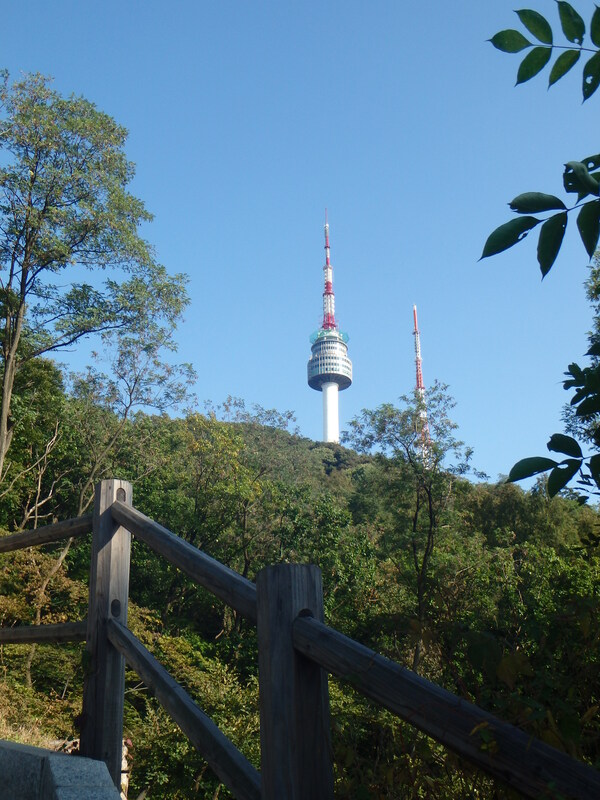 Namsan’s beacons were the center of a system in place throughout Korea. 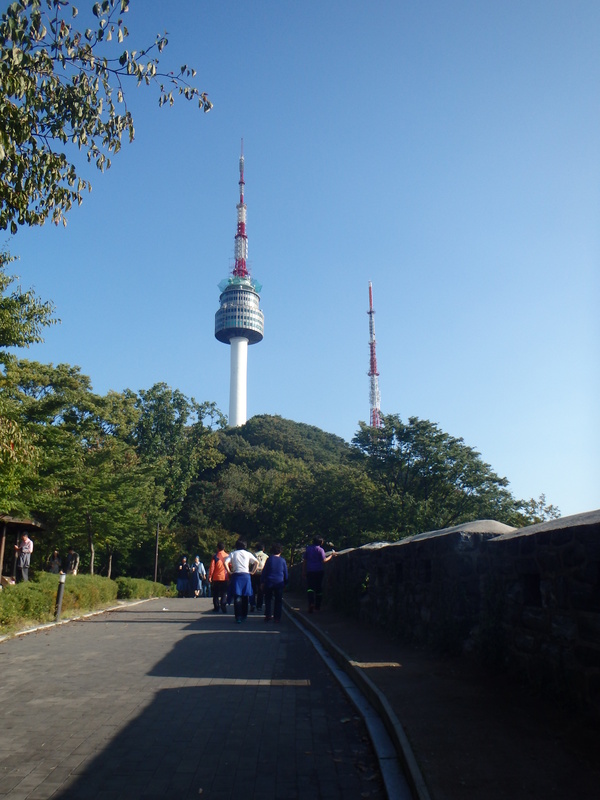 At the top of Namsan is N Seoul Tower. 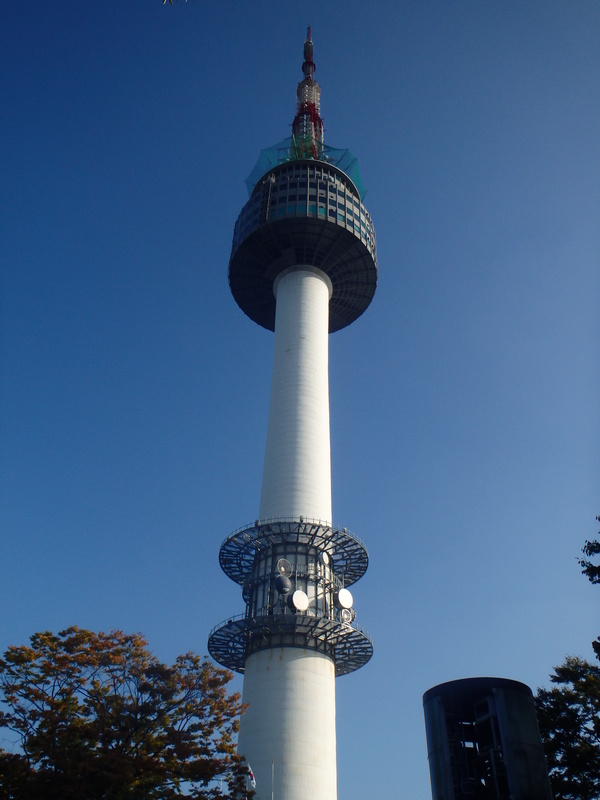 It was built in 1969 as a communications tower. 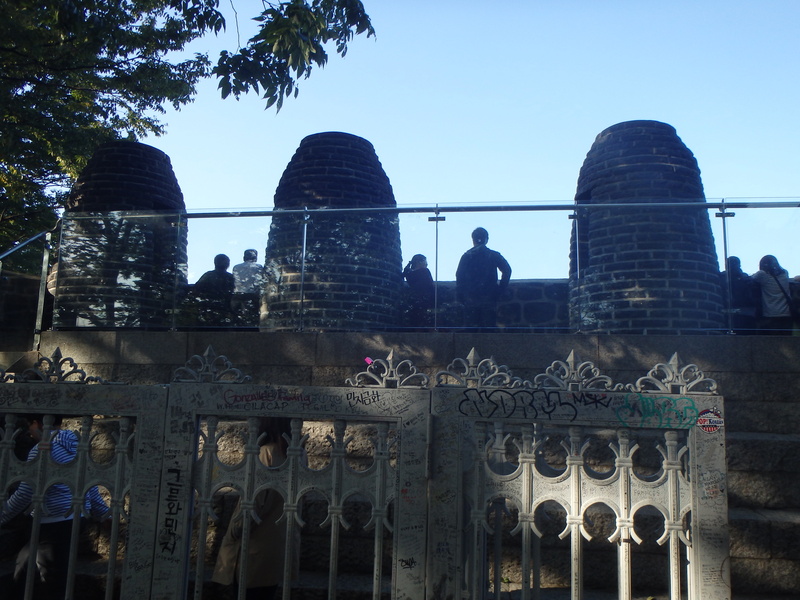 The park around the tower was opened to the public in 1980 and in 2005 its new owners renovated the tower making it a much more desirable attraction to visit. (Although, I don’t think the tower itself is all that attractive.) 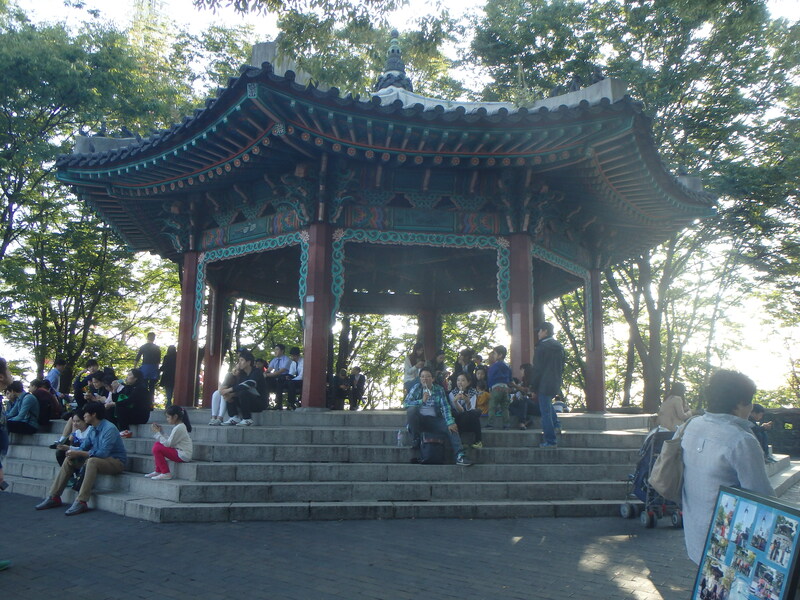 At the base of the tower there is a plaza where people can sit and enjoy a performance, eat, or have a portrait drawn. 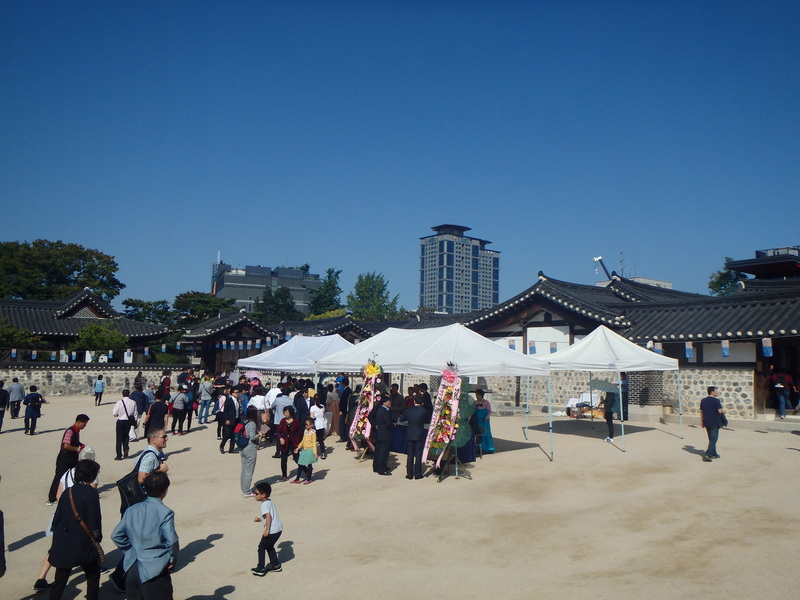 There are a couple restaurants in the tower and then a number of small food vendors next to the tower. 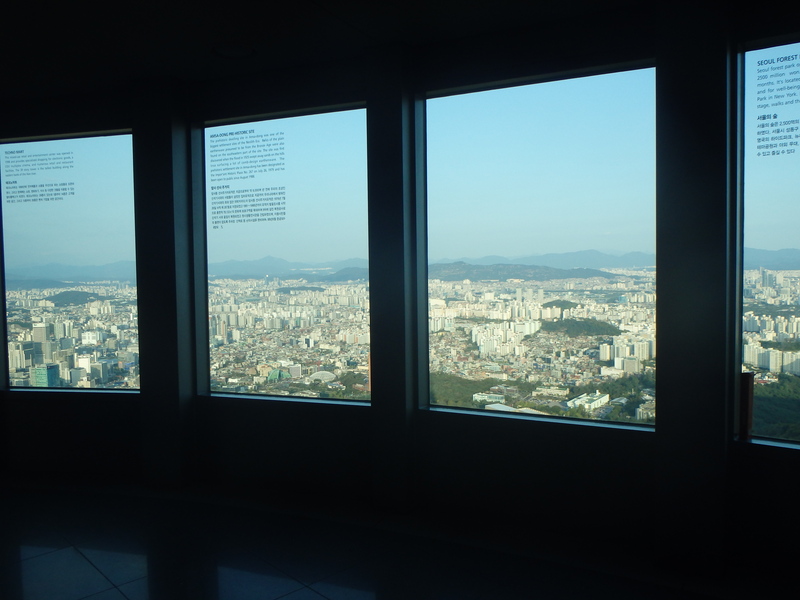 We bought tickets to go up to the observation deck for ₩20,000 which included 2 drinks and a popcorn! 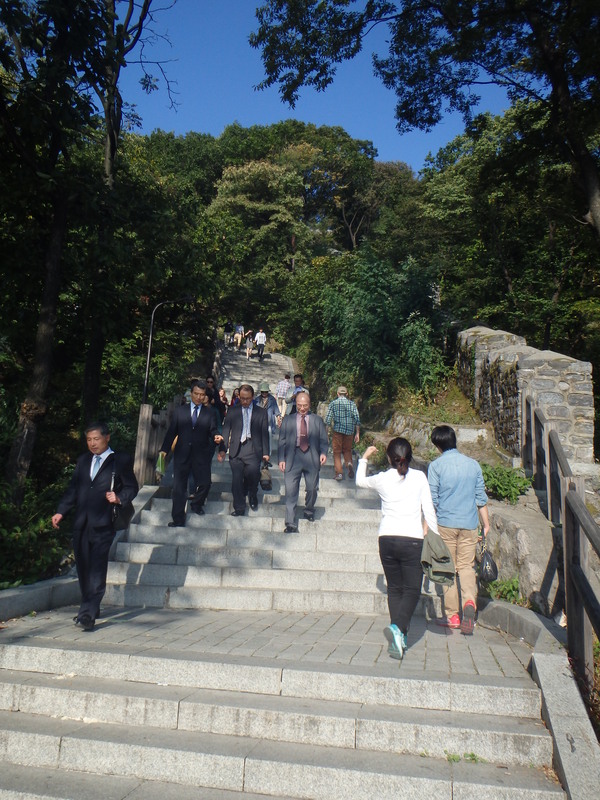 (Regular admission is ₩9,000/per person.) 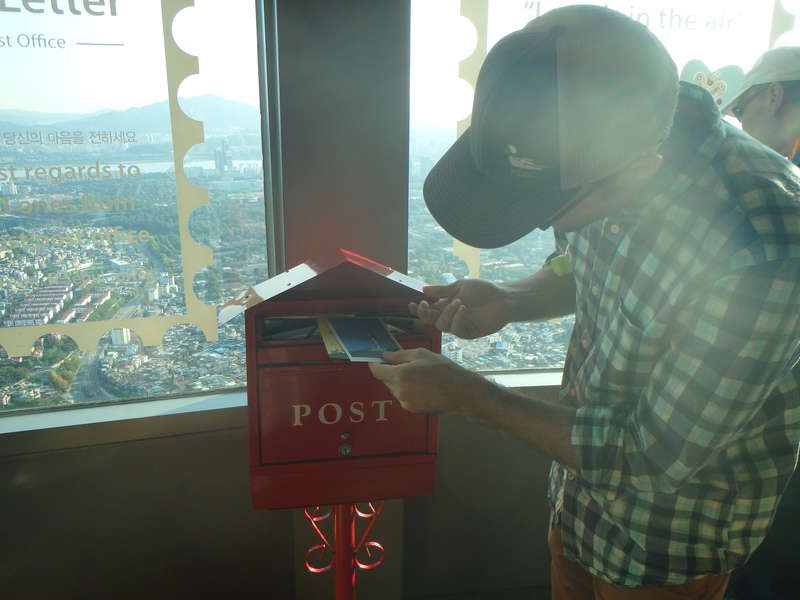 Most people actually took their drinks and popcorn up to the observation deck but we decided to get it afterwards – a good call, I think. 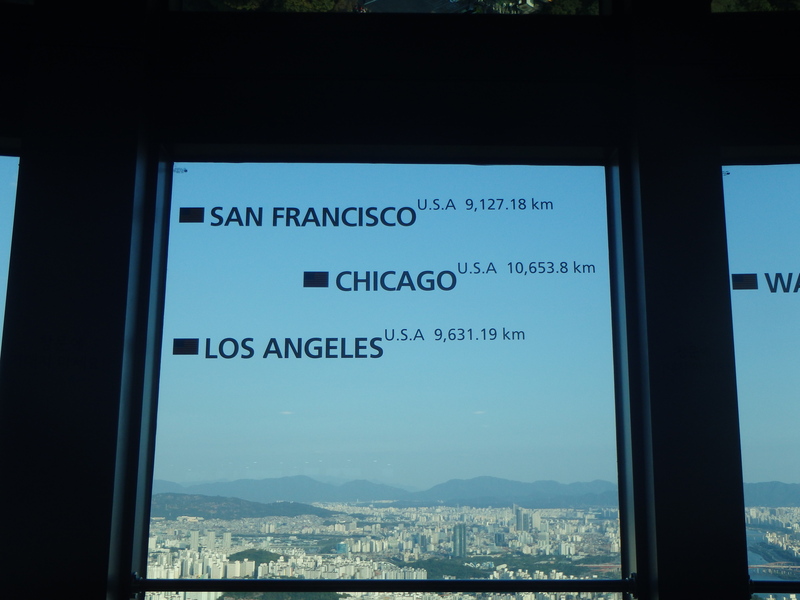 Once up at the observation deck we had a stunning 360 view of Seoul. 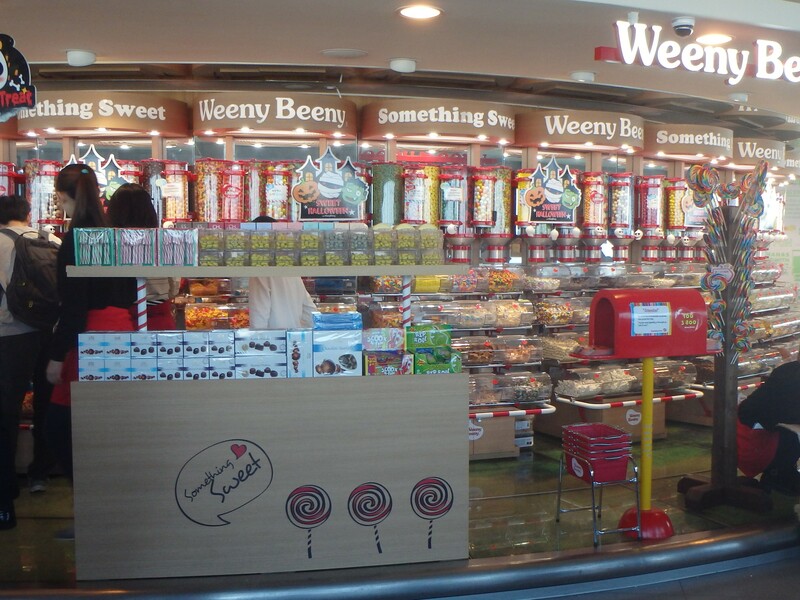 There were two stores – because what’s the point of going somewhere if you can’t buy something? – and a lot of people standing around on their phones. 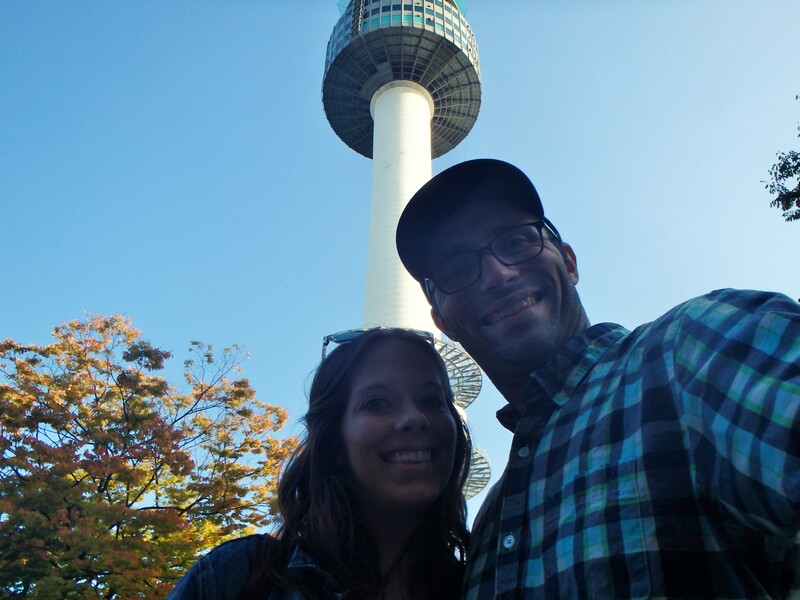 I’ve been to the Empire State Building and the Sears (Willis) Tower and this was unlike both of those experiences. At those places people go to see the view and admire it, here people were just hanging out. It was a little different. 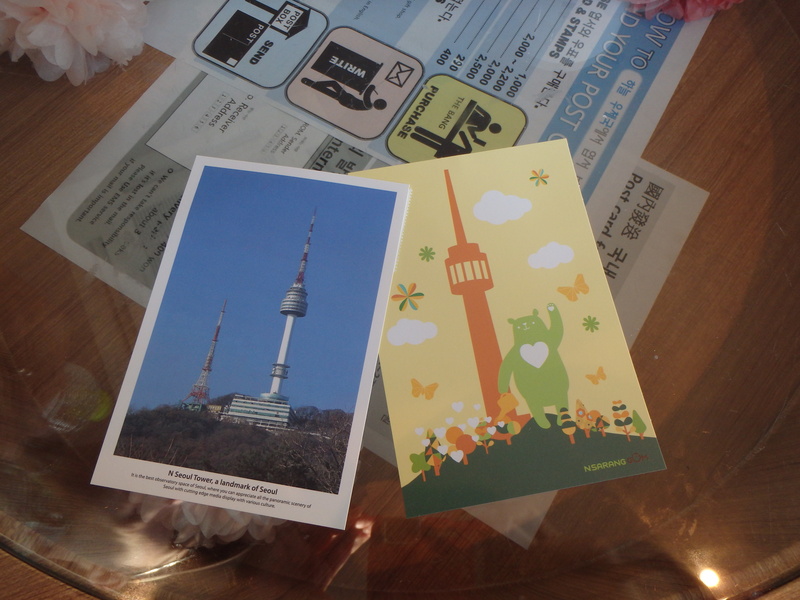 Then you could send it from the top of N Seoul Tower! 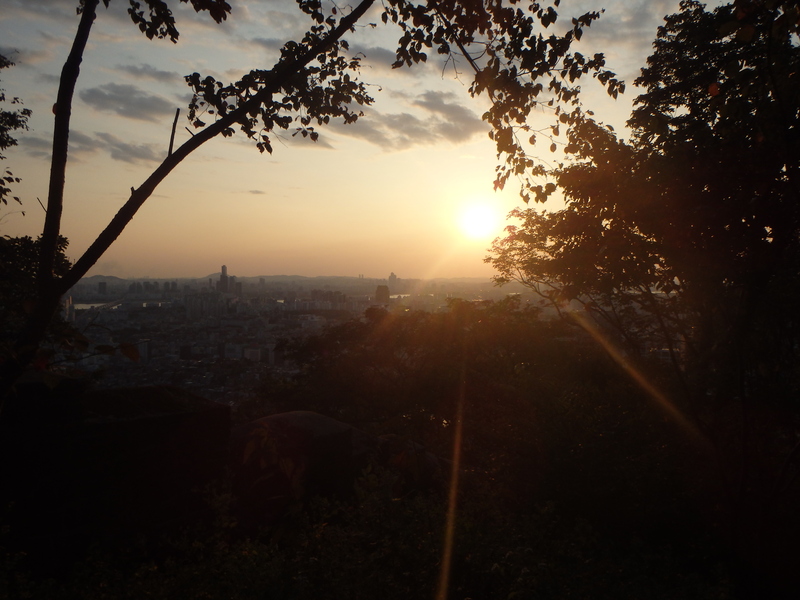 Next time we want to hike up Namsan at dusk and see the city lights from the tower. It must be quite a sight.